It is not easy to carry out family projects. Putting the focus on the children and building on their interests to create something as a family can be a complicated task, especially when you don't have the time or the proper space. Aiming to address this challenge, we launched the fourth annual Do It in Family. Do It in Family (DIF) is based on the Do It Yourself (DIY) and Do It with Others (DIWO) philosophies. Following the laboratory's dynamics and work processes, we created a context in which you can do what isn't possible in your garage at home. As in previous years, we'll focus on the division of roles and tasks between the adults and the children, and we'll try to find solutions to the conflicts that arise when working on something together. Self-directed learning and autonomy are two additional important points to keep in mind when the projects are being undertaken. We'll work as a family, as well as "in families," promoting everyone's cooperation. Because if the process is to be successful, then respect, patience, and cooperation are essential ingredients. By adding technology, design, and our imagination into all of this, it becomes an unbeatable recipe for spending Saturday mornings with your family. It will be a continuous project, so that when a project finds its stride, new projects and families will be incorporated. During registration, a wait list will be created, and when some families stop attending, or when the group becomes autonomous, new members will be incorporated. One of the final goals is to create a community of families that enjoy doing things together. The best way to learn is by using what we learn to do things that we like. We are all necessary and useful. We can all contribute, and we can all teach. The projects we do, we will do together, without leaving anyone out or working alone. We don't know everything, and there won't always be someone there to teach us. Sometimes we will have to go through the process of self-learning. No one is required to be here, so one of the most important things is to have fun. That doesn't mean that we don't have to work hard. Often times, hard work gives us satisfactory results. Other people's opinions will be taken into account. Together, we will decide what projects to develop and what steps to take. We will share our knowledge and teach what we have learned to others. One of the project's baselines will be teamwork. When we rush things, they don't usually turn out well. The goal isn't to finish as fast as possible. If no one gives you a task, be pro-active, that way you won't get bored! The most important things don't tend to turn out right the first time. Take your time to see what went wrong and fix it. Allow yourself the freedom to make mistakes. Technology is not the goal, it is the means. Learn what you can use technology for, and dedicate time to design and preparation. Technology isn't a way of doing things faster, it is a tool that gives us more time to think. 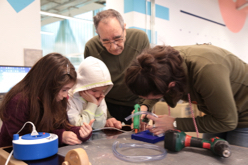 “The role of the teacher is to create the conditions for invention rather than provide ready-made knowledge.” Seymour Papert. We offer the environment, you provide the ideas.